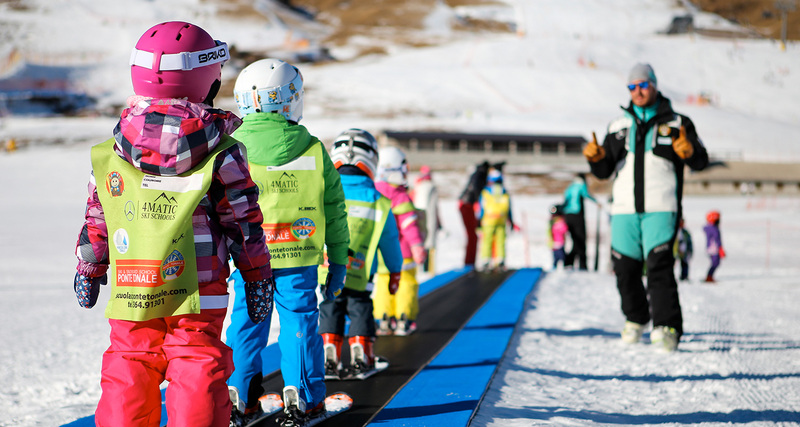 Our Playground Fantaski in Passo Tonale is an area dedicated to children where they can learn to ski and have fun at the same time. It is managed by qualified personnel offering entertainment programs and baby sitting service. Our playground area on the slopes: it is a safe area equipped with toys and paths where kids appreciate the idea of skiing as an outdoor game in safety and fun; a fantasy world where children will move their first steps on the snow thanks to specific teaching methods and the use of the carpet lifts in order to deal with more difficult slopes. When not used for lessons, the entrance is for a fee with special offers for families who want to accompany their children to admire their progress on skis or let younger children play. Opening hours: from 9:00 a.m. to 5:00 p.m. Entrance fee only for children (accompanying person for free). The ticket includes the use of the games (inflatable), toboggan runs, inflatables for children and the ski slopes.